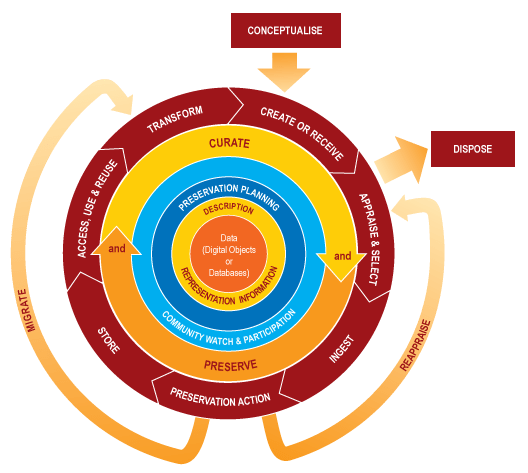 The notion of content curation is one that has traditionally been associated with libraries, archivies, galleries, or organisations working with objects or data in some way. For example, in the DCC Curation Lifecycle (UK) you will see a complex flow of the “appraise and select” activities which requires data managers to “evaluate data and select for long-term curation and preservation”. So ‘selection’ or ‘acquisition’ is then closely linked to a repository or institutional policy on collection development. Now the extraordinary thing is that the term ‘curation’ has become one of the latest buzz-words in the social online sphere, which has been transformed into an activity that is both about marketing and about organisation of the vast information flow that is delivered via social media. Social networking has definitely provided us with main channels for information flow. But in Curation: Understanding the the social firehose we are introduced to the fact that mainstream news reporting not only contributes to or makes use of this social news firehose, but is now also getting involved in curation – because someone has to make sense of the flow of citizen reporting of events. millions of tweets spewing out – different languages, mostly personal, some from people actually there, authorities, governments, media outlets, fake media outlets…you name it. And then someone has to make sense of it all – but if they do, the reward is possibly the most accurate, unbiased real-time account of an event you’re ever likely to get. So in the social media sense, content curation is the organizing, filtering and “making sense of” information on the web and sharing the very best pieces of content with your network that you’ve cherry picked for them . It comes down to organizing your sources, knowing which of them are trust worthy, and seeing patterns. curating my own content for myself (my own ‘go-to’ repository with tools like Diigo, Delicious, Evernote, Pinboard, Vodpod, Flickr, RSS readers etc. sharing this second level curation as a direct extension of the first level of personal curation. Now I can use all my social networking resources and return information back to my social community at the third level of curation. I saw Howard Rheingold’s use of Scoop.it, for a number of topics, including Infotention – which got popular. I watched with interest as Robin Good’s Real time News Curation grew and grew. Social content curation is about collecting, organising and sharing information – in a new package. I’m no archivist. But I am a digital curator of information for myself, and perhaps for others. 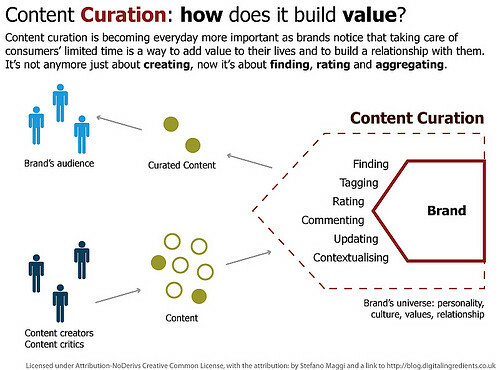 I’m interested to see how (what I call) the third level curation evolves. I like the idea of socially connected ways of publishing ‘what’s new’ and ‘what’s newsworthy’ as an ‘aside’ to my ‘go-to’ information repository such as my social bookmarks. My target audience are my past and present students in my subjects. I see my target audience being anyone interested in these areas? Or perhaps this is a waste of my time? I recommend watching this interview of Robin Good by Howard Rheingold , where they discuss Content Curation and the future of search. If I could crystal ball gaze what 2011 will bring in my own professional work and learning experiences, I’d be happy. Really I would. A few challenges that are staring me in the face will require my undivided attention, starting with this blog, my online tools, and my daily organisation of networked discussions. What should my focus be, as I transition into the working world of a university academic? 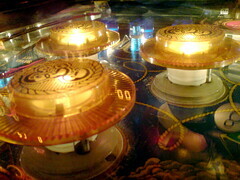 Be sure not to allow my head, thoughts, ideas ricochet endlessly like balls in a pinball machine. Put time limits on myself, and set realistic goals! Tidy up my online places, repositories, tools and then undertake a review of what I do and how I do it. Work out what I want to share, and why? Work out how I want to share! Commit to solid professional reading, and participate in professional exchange. Communicate with and work with people in my PLN to add value to my own work, and to stretch my own ideas beyond my current capabilities. Share whatever knowledge and experience I can through workshops, seminars, presentations, school-based work etc so that we continue to grow in our knowledge connections. Push back into my professional community through collaborating, writing and presenting. Not so … it all takes time and grunt. Currently my head really does feel like a pinball machine, with too many thoughts,worries, ideas, and work requirements competing for my attention. I’ve just completed some research assistant work for a colleague in the School of Educational Leadership at ACU, which I’m dovetailing with some course revision (before my official start at CSU) for one of the courses I will be teaching. I’m heading off for a day-long Committee meeting related to the ASLA XXII Biennial Conference 2011. I’m hoping to find time to get my head into Connectivism and Connective Knowledge 2011, with Stephen Downes and George Seimens. I’m looking at my list of articles that I have promised to write. I’m totting up the upcoming presentations that I’ve also committed to for 2011. I’m checking out the courses I’ll be teaching – all new to me, and nothing like my work in schools. I’m groaning … and wondering what to attack next, and how to improve things. Don’t get me wrong – it’s exciting but it’s also mind-bogglingly different. I KNOW there are plenty of people who achieve more than I can ever hope to manage – so at least I want to figure out how to help learning within my PLN. But at the end of the day I’m a creature of habit, and it takes self-imposed changes to keep that focus. Like Jenny, I’ve done some blog renovation – though this year I did not change the banner. When I started this blog back in 2006, it looked and felt different! I added some social buttons – to streamline the ‘look’ somewhat. Imagine that – we didn’t have all these tools back in 2006! So what will I use this blog for in 2011? I think that I will continue to do information dissemination – though not in the way I did back in 2006. I regularly share information via Twitter, Facebook, Diigo, Delicious, with other tools sneaking in at times too – something that wasn’t possible back in 2006. 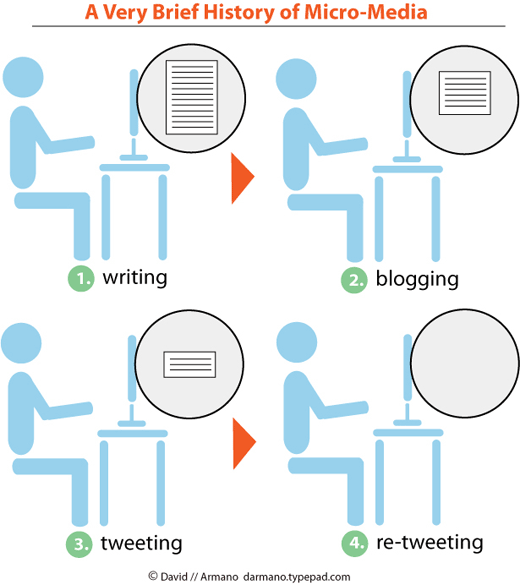 What this means is that my blog focus is adapting from the original 2006 focus. In addition to writing about things that grab my interest, I think that I will also communicate with ‘new’ education and library professionals – some who may be taking my courses, or who may just needing a helping hand into the networked learning world. Perhaps I will reflect on what I find in my new role, and the broader issues from a perspective beyond schools. I’m not a clever reporter, so I think I will leave that to others. I’m looking for really new ways of looking at all this. Like the tiny apartment that transforms into 24 rooms – I want to find out how to be more efficient with my work world in 2011. From A Very Brief History of of Multimedia.